it contains my all time favorite, Queen Phyllis, along with a few other shades to create an ultimate day and nighttime look. in order to create the nighttime look, you will use a technique called "Foiling". what is "Foiling"? Foiling is a technique that can be done with any eyeshadow to bring out the intensity and lustre of the product. 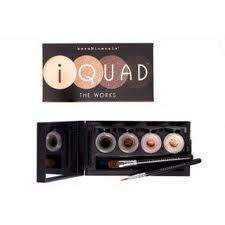 regular dry application of eyeshadow gives you a diluted/diffused look at the color. with the Foiling technique, your eyeshadow becomes more true to its color and becomes more dramatic. this technique is very simple. using any sort of liquid, (MAC Fix, Eyeshadow Primer, even tap water) dampen your brush and pick up a small amount of eyeshadow product. i then use the lid of the product i am working with to mix the liquid and dry powder to create a paste. apply your color and you will see a difference immediately. the concentration of makeup makes for a dramatic effect. good luck with this tip and stay tuned for a video on a great makeup look created with the foiling technique! Thanks for the tutorial you did on the foiling technique,I love it. I use it all the time now.